The Platygyra is defending itself and is clearly coming out the winner. The portion of the chalice that is next to the Platygyra has started dying off although the rest of the colony seems fine. My inclination is to leave things as they are. The chalice has plenty of room to grow in other directions and the Platygyra seems to be able to defend itself. What do you think? Can I leave it be or do I need to take more decisive actions? I just had a quick rather simple question, which i thought i would be able to find answers to everywhere but haven't been able to. I was wondering if it was safe to put candy cane corals next to other candy cane corals with out resulting in war and death? my tank has become pretty stocked with corals and finding space has become more difficult (yes i know i need a bigger tank) so i started grouping certain kinds of coral closer to each other that wont harm each other i.e. : my hammers are next to all the other hammers (really pretty with all the colors) frog spawn is next to frog spawn and many torches next to each other and even touching each other now. i have found information regarding pretty much all of my corals except this particular question. right now i have a huge candy cane colony and a frag of 2 heads right next to each other, i do not want to kill the frag. "Oh! If these are genetically identical, there is much less likelihood of chemical trouble amongst them" -which I figured but since they are different colors would that make them genetically different enough to where It would be an issue? I have a Candycane (brown with blue centers) with about 30 heads and it is at least 3 years in my tank. Next to it are some blue and grey colored ones that have been there over a year. I used to have a Frogspawn to its left but recently replaced it with a Hammer. Lately I noticed some head dying on my blue and grey Candycanes. It just looked like something stripped the flesh off the head. The past few morning I have noticed some long sweeper tentacles on the brown with blue Candycane. Are they the culprit. And why after all this time would they declare war. Yes, I understand and have read these before but I guess I needed a refresher. conditions are ammonia 0, nitrite 0, nitrate 5, ph 8.3, sg 1.025, calcium 420, dKH 12, temp 79, and flow rate is around 550 gph the majority of which is pointed away from the mushrooms and candy coral. I do 5 gallon water changes every week and I also dose with iodide and magnesium. The candy coral in question is about 14 inches from the light maybe a little more. Am I giving him to little or too much light is he still adjusting, I know many only come out at night but I have come out with a flashlight at all hours and never seen even one polyp open. 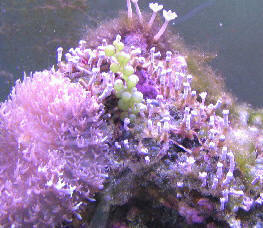 I have however seen him secret the brown stringy mucus from his polyps that is used algae correct? I do run carbon only through my canister filter and clean it every time I do a water change. I also only use RO/DI water I have a four inch sand bed. I know these animals are not completely photosynthetic and I worry that I have not been able to feed him. about a month but the rock that was his home is the same rock that I attached my candy coral frags to. I noticed before that all of the algae on this rock had died and is slowly returning. After reading about the toxins these animals produce in the linked pages I cant help but wonder if there are still traces of these chemicals on and in this piece of rock. As I said my mushrooms and polyps are doing very well and I got them at the same time I got my candy coral. If my suspicions are correct other than using ozone is there any other way I might be able to detoxify my system from this anemone. I don't want to do anything I am unsure of and any input would be much appreciated. Thank you again for all of your assistance.